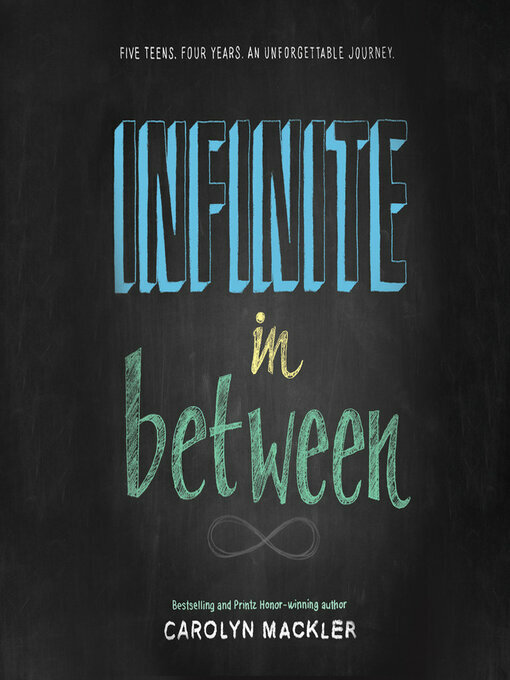 Title Infinite in between / Carolyn MacKler. Imprint Chicago : Dreamscape Media, LLC, 2015. Description 1 online resource (1 sound file (7 hr., 25 min., 15 sec.)) : digital. Summary Zoe, Jake, Mia, Gregor, and Whitney meet at freshman orientation. At the end of that first day, they make a promise to reunite after graduation. So much can happen in those in-between years...Zoe feels she will forever live in her famous mother's shadow. Jake struggles with the right connections in friendship and in love. Mia keeps trying on new identities, looking for one that actually fits. Gregor thought he wanted to be more than just a band geek. And Whitney seems to have it all, until it's all falling apart around her. Echoing aspects of John Hughes' The Breakfast Club, Carolyn Mackler skillfully brings the stories of these five disparate teens together to create a distinct and cohesive whole. Performer Read by Erin Yuen. Added Author Yuen, Erin, narrator. ISBN 9781681416915 electronic audio bk.